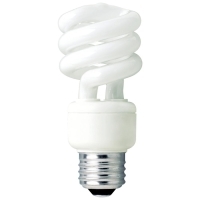 This 14 watt compact fluorescent from TCP is a SpringLamp (spiral shaped bulb) that can be used generally throughout the home. It produces 900 lumens of light, making it a suitable replacement for a 60-watt incandescent light bulb. The color temperature is 2,700 degrees Kelvin, creating a warm white color. NOTE: This bulb is not for use in dimmable fixtures, electronic timers, or with photocells as well as in emergency exit signs, enclosed fixtures, and in outdoor fixtures where there is a risk of the bulb being exposed to the elements. This TCP compact fluorescent contains mercury. Please have the bulb recycled once it has reached the end of its usable life.